Sew what's cooking with Joan! 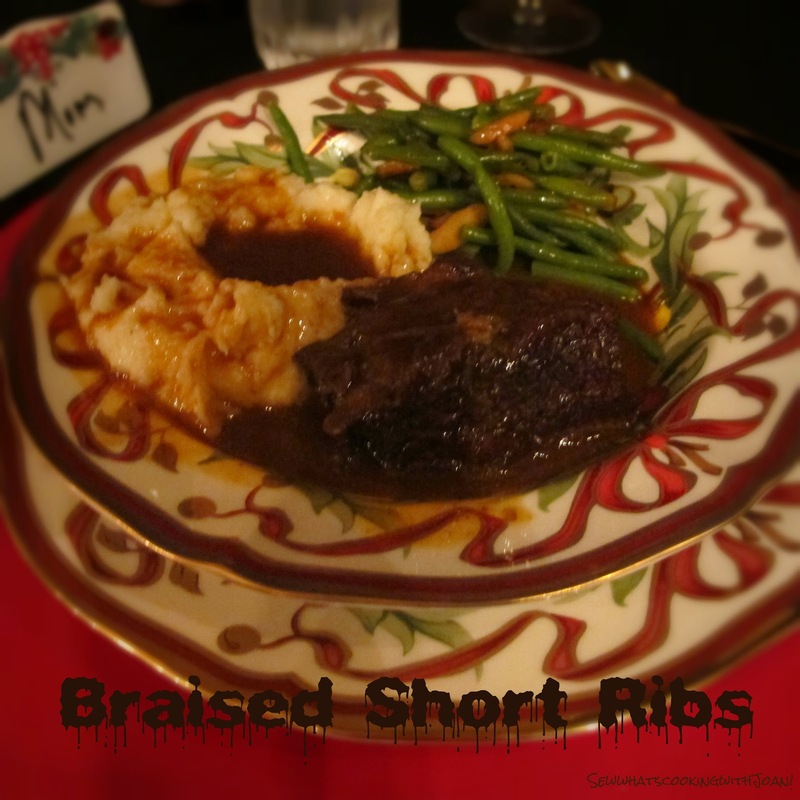 : Braised Short Ribs...can't stop thinking about them! Braised Short Ribs...can't stop thinking about them! When it's this cold, we just crave some beef with a delicious sauce and mashed potatoes. And in the fall and winter, my top pick for inexpensive, easy, and absolutely succulent meat is short ribs. Have you ever made short ribs? They're cheap and easy. Here's a guide to cooking them. Short ribs have been a hot item for a few years now. In fact, I went to four grocery stores just before Thanksgiving holiday weekend, looking for short ribs, and none of them had them! I finally got on my cell phone, located some and had the butcher hold them for me. The reason for this is simple. Short ribs are relatively inexpensive (they come in around the same price as stew beef or other braising cuts) and yet they are foolproof and thoroughly delicious. When you go to buy short ribs at your meat counter, you will usually have to ask the butcher for them. You can buy short ribs with the bone still attached, which is usually cheaper. The more expensive boneless cuts are convenient, though, and nice for serving. 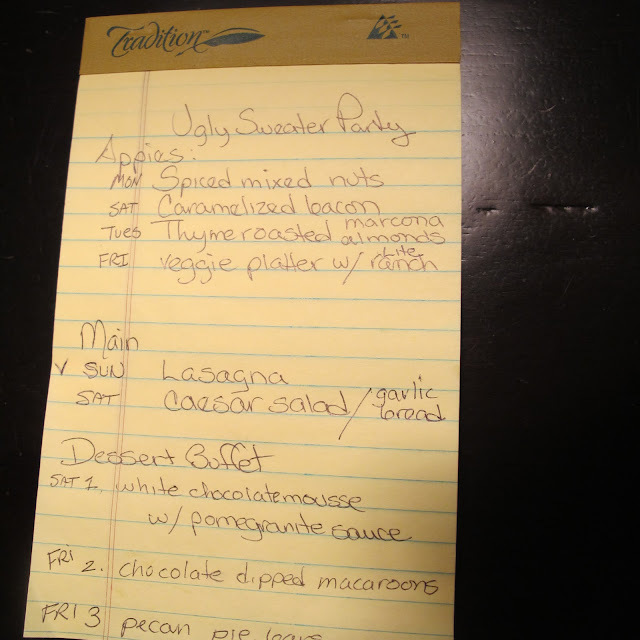 I cooked this up for a simple one plate dinner on the Friday after Thanksgiving for family. The boys watched football most of the day and the girls had gone for our annual "girly luncheon" and a little Black Friday shopping. I prepped everything ahead and had my table set, so I just popped it in the oven when I arrived home! Easy squeazy lemon cheezy! 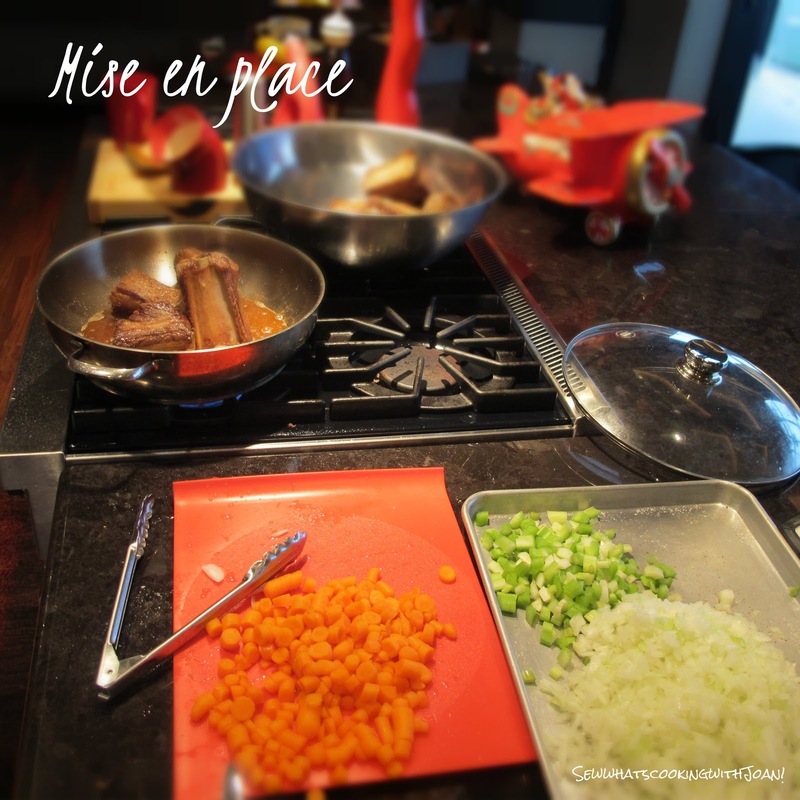 Mise-en-place (pronounced Miz en Plaz) is a French phrase which means "everything in place", as in set up. It is used in professional kitchens to refer to organizing and arranging the ingredients, I learned this phrase early in my certificate series classes. Preheat oven to 350°F. Season short ribs with salt and pepper. Heat oil in a large Dutch oven over medium-high heat. Working in 2 batches, brown short ribs on all sides, about 8 minutes per batch. Transfer short ribs to a plate. Pour off all but 3 tablespoons drippings from pot. To easily peel the pearl onions, put them in a pot of boiling water for about a minute. The peel will easily peel off. Cook until short ribs are tender, 2-2 1/2 hours. The last 1/2 hour add the pearl onions. Transfer short ribs to a platter. 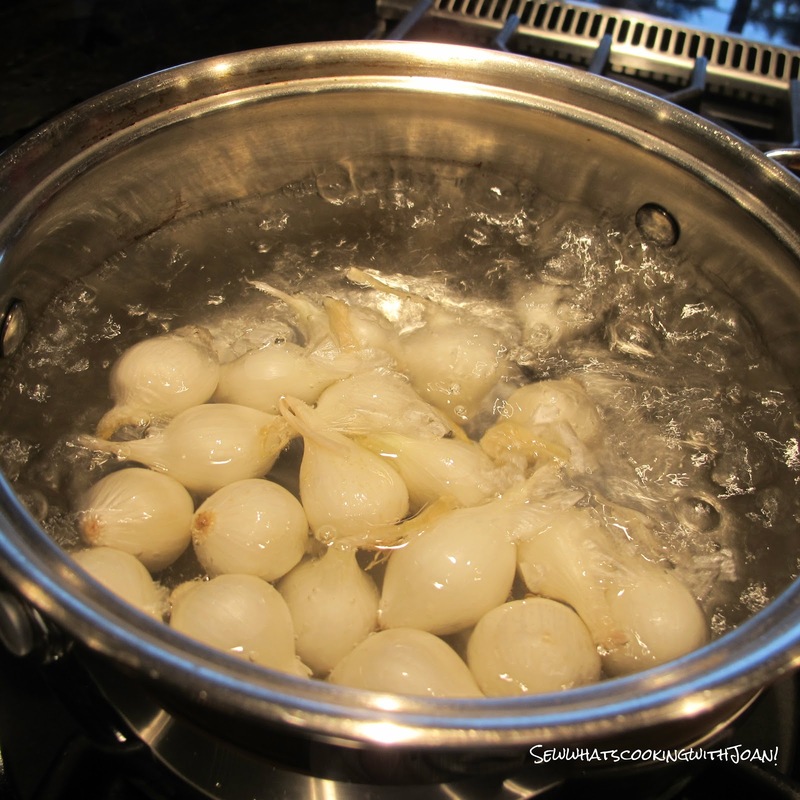 Strain sauce from pot into a measuring cup, pluck out the pearl onions and add to ribs. Spoon fat from surface of sauce and discard; season sauce to taste with salt and pepper. Serve in shallow bowls over mashed potatoes with sauce spooned over. 0 points for plating :-( always, always have a damp, clean cloth ready to wipe the edges of the plate. I have known this forever...it was repeated and repeated during my certificate classes. It's plating 101......no real excuse except, rushed to get the food to the 10 guests with the added step of a picture. I sent this recipe with a picture to one of my new hiking group members, as, we were talking about food and she mentioned she would like this recipe for a dinner party she had last night. I said no problem, my blog is mostly written, I'll just copy and paste to an e-mail. Here is what I woke up to this morning in my e-mail box! Thank you, thank you, thank you! I prepared this last night for our dinner party and WE LOVED IT! My husband is asking when I'll serve it again and our guests commented how they were greeted with a lovely warm, wrap your arms around it welcoming aroma. I plated it like your photo and served a small but bright salad of bib lettuce, red onion, Clementines and avocado. I thank you for your generosity. It’s basically full on holiday time right? I mean, I’m ready to start throwing some parties and all that goes along with it! 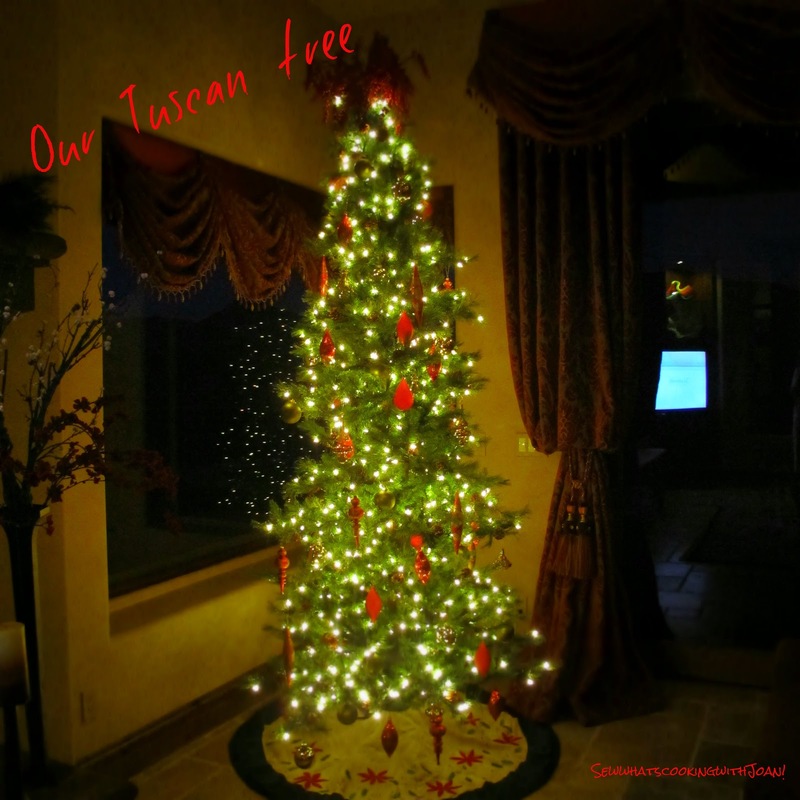 My trees are up, four total, wreath's on every door and gate From Scottsdale to Seattle...call me ready to PARTY!!! This week alone we are attending 5.....yes FIVE parties!! Yippeee! Wee Bear and I love to have fun!! Here is my menu plan, that I have already started to prepare. I prepare a draft, believe me when I say draft, as I change as thoughts or ideas come to mind. Sometimes I add more, time permitting or delete, if time runs out. I put the day I will make next to the food item and check the item once it is done. It gives you a time line and a feeling of control, as you complete each item and check it! Feel free to copy my plan for your Holiday party! If you want a recipe e-mail or put into the comment's below! I would love your Italian dinner party recipes! P..S. I plan to try the short ribs soon! The ribs are a must! They are amazing!! 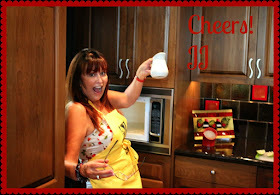 I will be featuring recipes as we get through the month. Let me know if there are some you would like right away, and I will e-mail them to you! 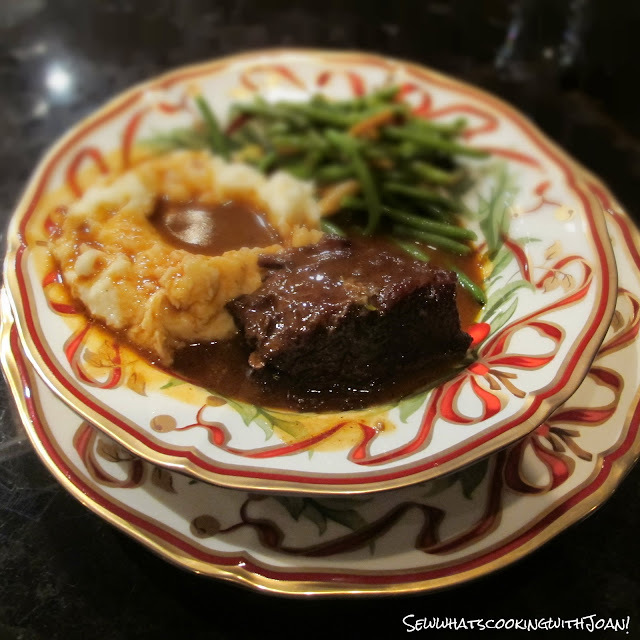 I made your braised short ribs last Friday night for a dinner party and they were a huge hit. I told my friends about you and your blog so you may be getting some new followers! I am making these tonight! Delish! so glad the cooler weather has come for dishes like this!